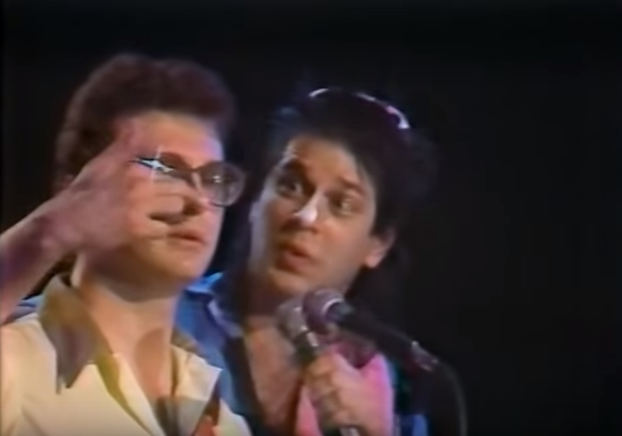 Since finally “discovering” Blotto this summer, I’ve already viewed their concert Tonight at Toad’s (3/25/82) numerous times, so much that I know the whole broadcast by heart. 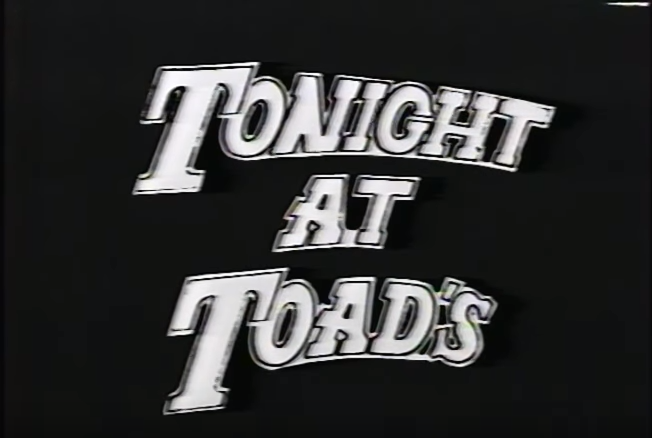 The comedic rock band took the stage at Toad’s Place (New Haven, CT) for a TV broadcast. The amicable, well-rehearsed group kept things at all times entertaining. Blotto opened with the satirical “(We Are) The Nowtones)”, an oldies-style advertisement for a band who’ll play anything you want; and they’ll say “thank you” at the end of every song! It’s a clever little pastiche with even the stage lighting being part of the story. Your aunts don’t like me and your uncles are a bunch of thugs. He says if he was president, the world would be a better place. Dear God, that sounds like a nightmare. But it gets worse! Like when I come over and your father tells me, “don’t park in the driveway ’cause your car drips oil on the new white pebbles!” And then when I come inside, the cat jumps all over my lap, and gets hair all over my shirt and pants! And your grandmother sits on the newspaper and gets it all wrinkled and balled up, I can’t even read it. And your sister brings out her scrap book, she wants me to look at all of her old prom pictures. I mean, who cares! And your brother wants me to help him with his science project, dissecting frogs! Oh, what a mess! And then when I go in the bathroom, and wash my hands, and all they have is soft soap, and my hands smell like coconuts, and I can’t dry ’em on those little guest towels, so I gotta dry ’em on my shirt, which is already covered with cat hair! What a great little pop rock tune, though. That’s the thing about Blotto. Even if mixing comedy and rock (a dicey proposition to be sure) isn’t your bag, there’s no denying Blotto were top-notch. The musicianship and especially their singing was always spot-on. They could tackle multiple styles easily, and had an arsenal of three lead singers (Bowtie, Broadway and Sergeant Blotto) to harmonize. They also just wrote good songs. Broadway goes next with “Occupational Hazard”, also from the forthcoming album. Enjoy this decent rock n’ roll track about the dangers of being in a band. Another good tune: if the songs were not good enough, the lyrics wouldn’t carry the show alone. Blotto’s big hit was 1979’s “I Wanna Be a Lifeguard” from their debut EP. Sergeant Blotto leads the charge to the beach in this surf-rock new-wave anthem. Poor Sarge, stuck working in a shoe store all summer. His dream job? Being a lifeguard of course! “I want an ocean, and some sunscreen lotion. Take me to the beach with a thousand pretty girls in reach!” Sounds awesome Sarge, sign us up. 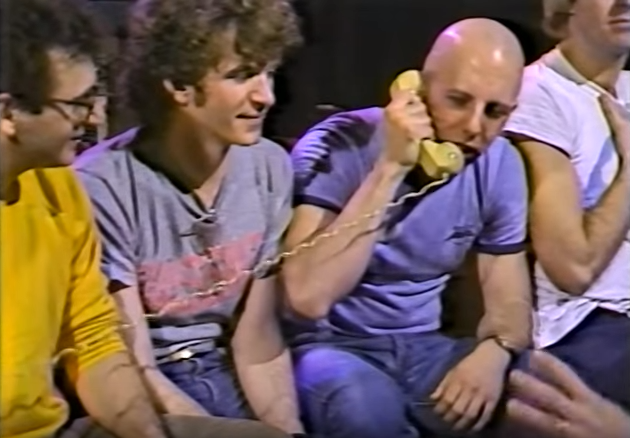 The show takes a break for an interview with the five Blotto members, including bassist Cheese and drummer Lee Harvey. They talk about the still-untitled album and banter about naturally. Why were Blotto not huge? Watching this video, it’s easy to imagine Blotto appealing to many. The legend goes that they were once offered a major label deal but would have lost creative control. They chose to put out their album on Blotto Records instead. Maybe if they had signed with the label…? Who knows. Watch this interview yourself and see a band that coulda woulda shoulda. Back to the music. “Goodbye, Mr. Bond” is sung by the evil villain “Dr. Bow”. Any Bond fan will take delight in this spy adventure. Will Bond escape this time? “I could kill you right now, but no! There’s a better way…” That usually doesn’t go well for the villain, but the song goes on the verge of progressive rock during an instrumental breakdown. “Goodbye, Mr. Bond” flows seamlessly into a cover of “Secret Agent Man” with Sarge on lead vocals. Kids of the 80s remember Blotto for one song: “Metal Head”. Sergeant Blotto’s friends are gettin’ worried. He’s turning into a heavy metal head! It has all the necessary ingredients for a metal song: Solid riff, howlin’ vocals, ripping guitar solos, thunderous drum fills, and screams aplenty. This great little show is a wonderful way for you to enjoy the next 45 minutes of your life. Get Blotto. Man, everyone knows that drying your hands on your shirt is a big mistake! When I’m in a jam like that, I use the pockets! Good call, J. But maybe he didn’t have any pockets? It was the 80s and style was questionable. Good point, Mike… good point. Oh man that stuff’s awesome! That segue into Secret Agent Man is well planned – nice get Blotto closing advice too! He still believes in the superior race. He says if he were President the world would be a better place. Was her father Donald Trump?